> Attempting to seal ordinary wire in glass will always fail due to the vastly different expansion ratios for glass and metal. Dumet wire on the other hand, has the same expansion ratio as glass - and is what is used for making light bulbs and other devices that require a reliable glass-to-metal seal. Dumet wire will form a vacuum tight glass-to-metal seal on common as well as crystal (leaded) glass. If you've ever considered making your own light bulbs, HV/discharge or X-Ray tubes - you will certainly need some Dumet wire. 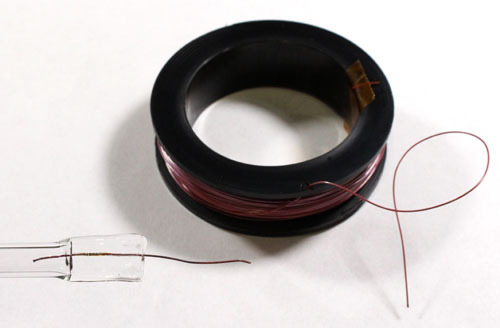 Just heat up your glass tubing until the glass is soft, and squeeze closed to seal while the Dumet wire is red hot. Wire diameter is .014" (.35mm). Available in 10 foot rolls.